S.W.A.T Kats is a game based on the short lived cartoon series S.W.A.T Kats: Radical Squadron. The series would only last for 2 seasons but built a sort of cult following afterwards. 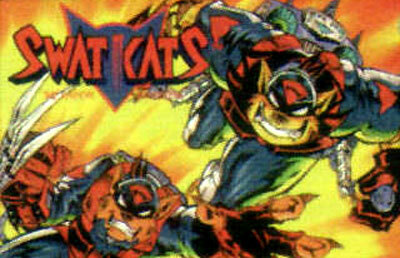 The Swat Kats are a trio of mechanics by day, but secretly also a group of superheroes defending their home, MegaKat city, from creatures and evil villians. Swat Kats is essentially a side-scrolling action game. You start off using T-Bone and Razor and guide them through 5 different worlds of action packed excitement. Game levels are based on different episodes of the show. As you progress through the game you can increase your weapon levels and gain new weapons. Mode 7 graphics are featured in some parts of the game. A unique feature to the game is the ability to start on different levels.